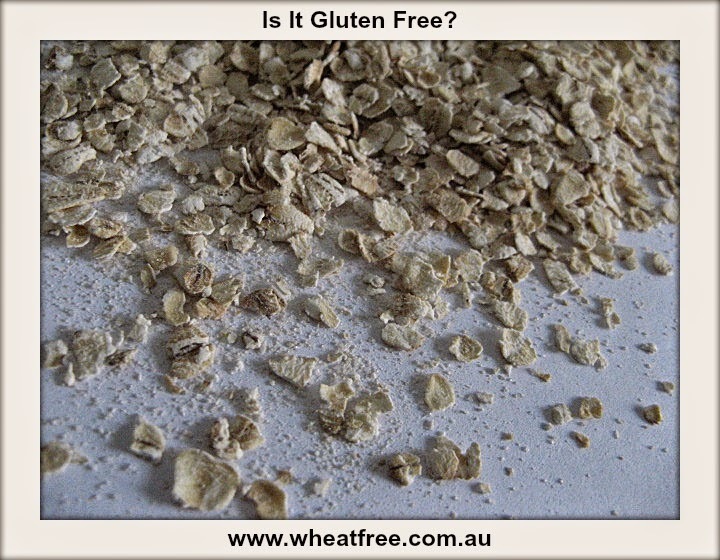 WheatFree.com.au: Is it Gluten Free? Foods made from grains (and grain-like plants) that do not contain harmful gluten, including: Corn in all forms (corn flour, corn meal, grits,etc.). Rice in all forms (white, brown, basmati and enriched rice). Also amaranth, buckwheat (kasha), Montina, millet, quinoa, teff, sorghum and soy. We are of course putting uncontaminated oats onto this list that has been tested with NO traces of gluten. Ingredients with "wheat" in the name including wheat starch, modified wheat starch, hydrolyzed wheat protein and pregelatinized wheat protein. Buckwheat, which is gluten free, is an exception. Barley and malt, which is usually made from barley, malt syrup, malt extract, malt flavouring and malt vinegar. Breaded or floured meat, poultry, seafood and vegetables. Also meat, poultry and vegetables when they have a sauce or marinade that contain gluten, such as soy and teriyaki sauces. Flavourings are usually gluten free, but in rare instances can contain wheat or barley. By law, wheat would have to be labelled. Barley is usually called malt flavouring. In extremely rare instances, neither barley nor malt is specified in flavouring. Modified food starch is gluten free, except when wheat is noted on the label, either as "modified wheat starch," modified starch (wheat) or if the Contains statement at the end of the ingredients list includes wheat. Oats used to be considered unsafe, but recent research has shown that a moderate amount of special pure oats is safe for most coeliacs. Several companies produce oats specifically for the GF market. They are labelled gluten free. Pharmaceuticals can contain gluten, although most are gluten free. Check with the pharmaceutical company, especially if you take the medication on a continuing basis. Seasonings and seasoning mixes could contain gluten. Wheat will be noted on the label as required by law. Soy Sauce is usually fermented from wheat. However, some brands don't include wheat and are gluten free. Caramel colour is almost always made from corn, but it can be made from malt syrup. However, in more than 10 years, we have not been able to find a single instance of a caramel colour produced this way. Companies in North America say they use corn. You can consider caramel colour GF. Hydrolyzed vegetable protein is a phrase that under federal regulation should not be used on a food label. Food processors have to identify the "vegetable." So you might read "hydrolyzed wheat protein," which would not be gluten free, or "hydrolyzed soy protein," which is gluten free.